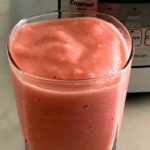 One of my favorite things to make in my blender is a Strawberry Banana Smoothie. When the smoothie craze hit a few years back, I wanted to join in and see what all the fuss was about. So I pulled out my Ninja Blender and began mixing up concoctions every morning. I honestly wasn’t ready to go full-go into the ‘healthy’ smoothies. There was just something unappealing to me drinking a green smoothie. I think it was tiny chunks of spinach that I could still see when a friend convinced me to try one. So I stuck with the sweet fruity smoothies. And the strawberry banana smoothie seemed to be not only my favorite, but a family favorite as well. There are only 4 ingredients required to make a strawberry banana smoothie. Be sure to layer your ingredients in the order listed. The juice goes in first. First begin with the liquid base of orange juice. Then add in an individual serving size of vanilla yogurt. You can use standard, Greek, or non-dairy yogurt. The choice is up to you. The consistency will change slightly based on your choice, but you can easily adjust the thickness. If your strawberry banana smoothie is too thick, add in additional orange juice. Vanilla Yogurt adds a smooth texture to this smoothie. On the contrary, if it is too runny, add additional ice to thicken it up. Next add in one fresh or frozen banana. I don’t normally have bananas in the freezer, so most of the time, I use a fresh banana. And finally, add in a cup of frozen strawberries. 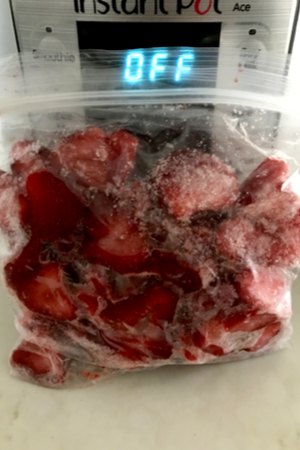 Unlike the bananas, I always have frozen strawberries in my freezer. Frozen strawberries from the summer harvest. During the summer we go to the strawberry patch and pick baskets full. I then wash and freeze them in one cup portions for uses just like this. 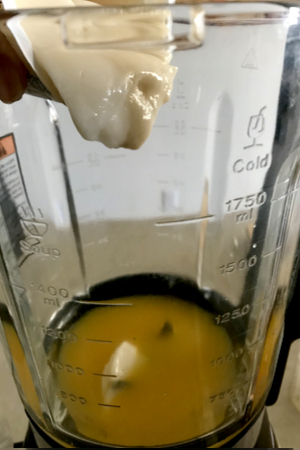 I used to add all the ingredients in my standard Ninja blender and pulse until all of the ingredients were pureed and smooth. However, since I purchased my Instant Pot Ace Blender all I have to do is put the ingredients in the order listed and push the Smoothie Button. 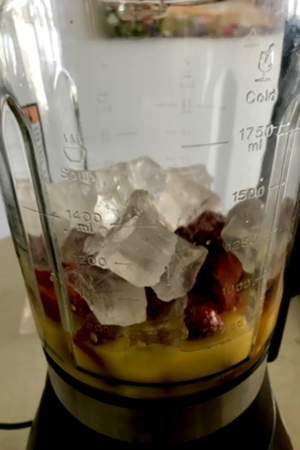 If you want a thinner smoothie, add less ice. Add more for a thick smoothie. In less than 2 minutes, the Strawberry Banana Smoothie is ready! This recipe is enough to make 4 small servings. What do I do if I don’t drink the smoothie right away? I make popsicles of course! Pour your smoothie in popsicle molds for a great frozen treat. Just pour your smoothie mixture in a popsicle mold and you have a ‘healthy’ snack whenever you need one! We like to keep the popsicles on hand at all time. It’s much less tempting to eat junk food when you have a smoothie popsicle in the freezer whenever you get that late night craving. 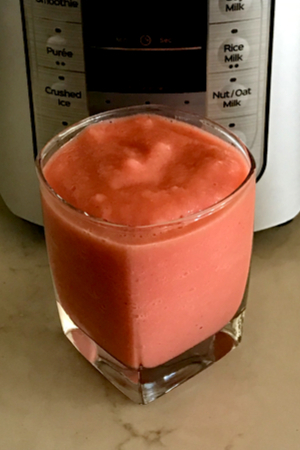 Strawberry banana smoothie is a delicious way to boost your fruit intake. Drink it or freeze it to make popsicles! Place the items in the blender in the order listed. 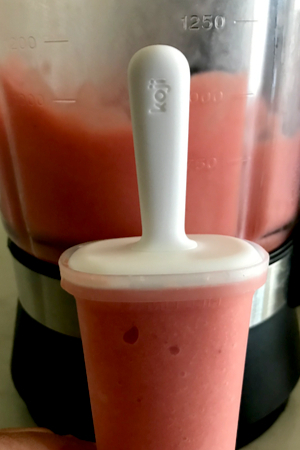 For the Instant Pot Blender – push smoothie button. 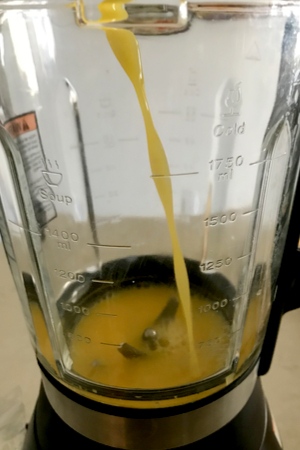 Other Blenders – pulse until smooth. Add additional orange juice if too thick. Add more ice if too thin. Serve to drink or freeze in popsicle containers.